Global solutions to reduce methane emissions from ruminant animals are feasible because the microbes causing the emissions are similar around the world. 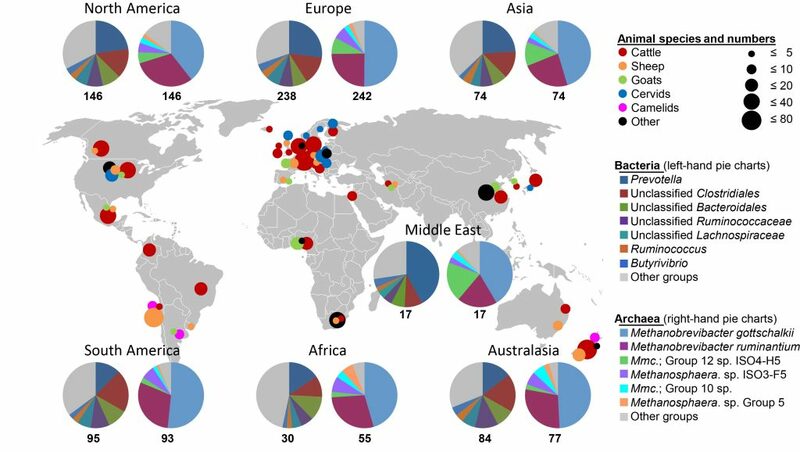 This was the major finding of a Livestock Research Group project, sponsored by the New Zealand Government, that surveyed the diversity of microbes present in rumen samples in 34 countries over a range of farming systems. As well as the expected samples from sheep, cattle, deer and goats, there were also some from buffalo and giraffes. The project found that the same major groups of methanogens dominate in nearly all rumens across a wide variety of species and animal diets. This means that new technologies that seek to reduce methane emissions by influencing rumen microbes should have worldwide application. Globally, 140 scientists from 73 organisations contributed to the rumen census, with microbial samples collected over two years. The study has provided knowledge that no country could have delivered on its own, and the benefits are also global. The project was a collaboration of scientists from the Livestock Research Group’s Rumen Microbial Genomics Network.